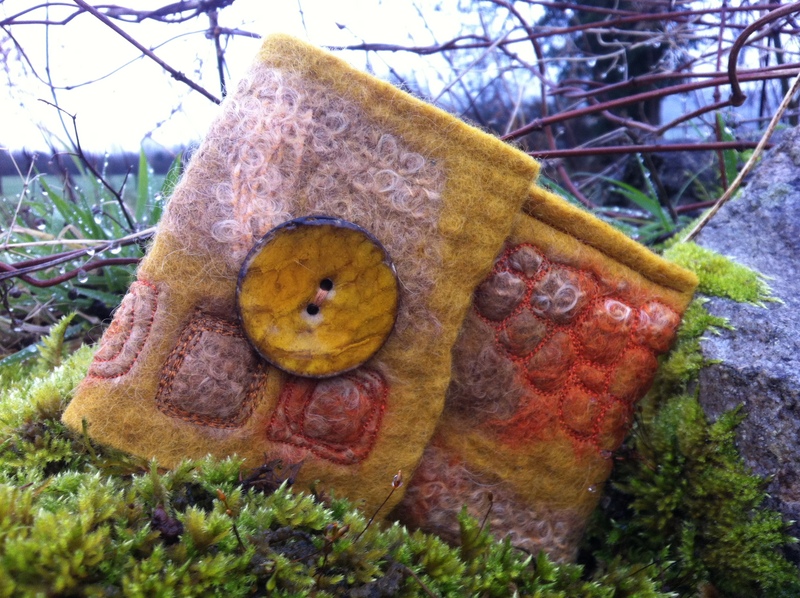 Up-cycling mohair off cuts into little felt pouches and hard at work organising my new online presence! My sister Lizzy requested a little cell phone holder as one of her Christmas presents and since this proved to be a big hit with various members of the family I decided to get in gear and felt some more! Working with woven mohair off cuts from Cushendale Woollen Mill and a few scraps of silk I laid out a simple design on top of two layers of finnish wool (thanks Chrissie!) 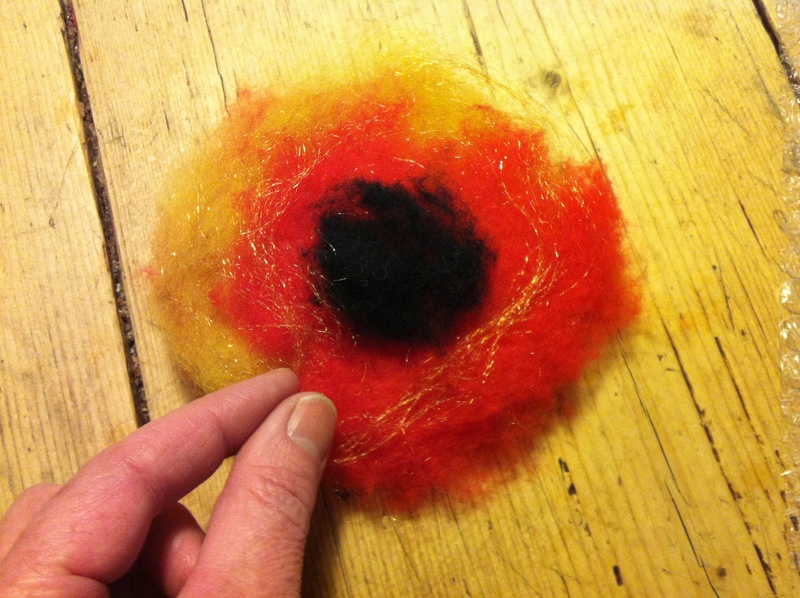 and created a piece of flat felt. The completed felt was nice but not very exciting and that’s where the fun began, I got out my sewing machine!!! Selecting just a few embroidery threads with a lovely high sheen I stitched simple shapes in both contrasting and complimentary colours on top of the silk and highlit various squares of the mohair off cuts. As learnt during a workshop with Lisa Klakulak at ‘Felt in Focus’ in Denmark last July, by stitching in a particular way it is possible to raise the surface area of the felt and create added texture and interest. Beautiful buttons picked up with Kirsten Lang in Odense completed the last two pouches and now I have four more pieces of felt completed just waiting for some stitching today. I do love how in places the stitching echos the shapes of my dry stone walls, free form but effective I think! Finally for today, I am in the process of organising my online presence to work in the most effective manner possible during 2012 and from this time forth. In effect this means that I have joined Pinterest (check it out, it’s addictive! ), set up a Tumblr blog (a little like Twitter for bloggers! ), am working on my Big Cartel store and will be reactivating my Etsy shop, busy, busy time indeed!!! 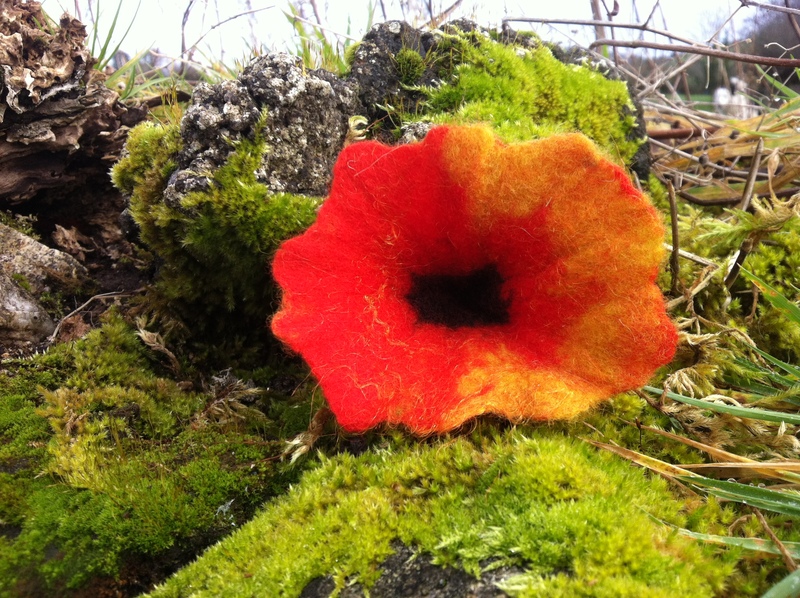 Do please follow me on these new sites if you are interested, they will keep you up to date with all my activities in addition to my biggest love which as you already know is felting!!! I’m trying to relax this afternoon after a brisk walk with a friend this morning. It’s hard to switch off totally so now I’m in front of the stove planning a big new raw fleece cushion to put in the chair beside my range. Maybe I’ll start this tomorrow or maybe I’ll hit the sales (I need a new jumper or two), either way it will be underway by Thursday morning and I promise some photos then! Thanks to you all for so many Christmas wishes, I hope everyone is having a festive and fun time!!! Felt flower tutorial at last!!! Approx 2 to 3g (.07 to .105oz) merino or Icelandic wool (batts or roving) in complimentary or contrasting colours, a spot of clashing colour often works well! A little silk fibre, tencel, firestar or linen to add embellishment if desired. Two pieces of bubble wrap no smaller than 12” square or one larger rectangle. Warm water and soap. An unscented soap with a high fat content is the best for your hands, most soap does work but I prefer olive oil soap or goat’s milk soap. A small towel and a bottle for the soapy water, an old plastic mineral or milk container with small holes pierced in the lid makes a good cheap sprinkler! Place your towel on the table with one piece of the bubble wrap on top, bubbles up. Lay out an even but light circle of wool approx 4” to 5” in diameter and lay a second layer on top of the first. Overlapping the complimentary or contrasting colours works well as does laying out a darker splodge of colour in the centre of your flower. Place your hand on top of the pile of wool and ‘vibrate’ it slightly to help the fibres stick together, check that there are not any extremely thin areas. Patch if necessary and add then a little of your embellishing fibre around the outer edge if using. Note, silk, tencel, firestar or linen fibres don’t actually felt themselves, the wool ‘catches’ them so please use sparingly. Sprinkle some warm soapy water evenly on top of the wool, enough to compress the fibre but not enough to cause water to run off the bubble wrap. You don’t need loads of suds so don’t go wild with the soap! Place the second piece of bubble wrap on top of your flower bubble side down, if using a rectangle of plastic lay out the wool on one end and fold the other over. Gently press down to work the water through the wool and remove any air pockets, lift the bubble wrap up carefully and see if the flower is totally wet through, add a little more water if necessary. Replace the top layer of bubble wrap. With wet soapy hands carefully rub the flower in a circular motion on top of the plastic for about a minute, turn over and repeat on the other side. Remove the top layer of bubble wrap and gently rub directly on the wool with soapy hands. Once a ‘skin’ has formed on the flower pick it up and start to shape it into a three dimensional shape with your hands. 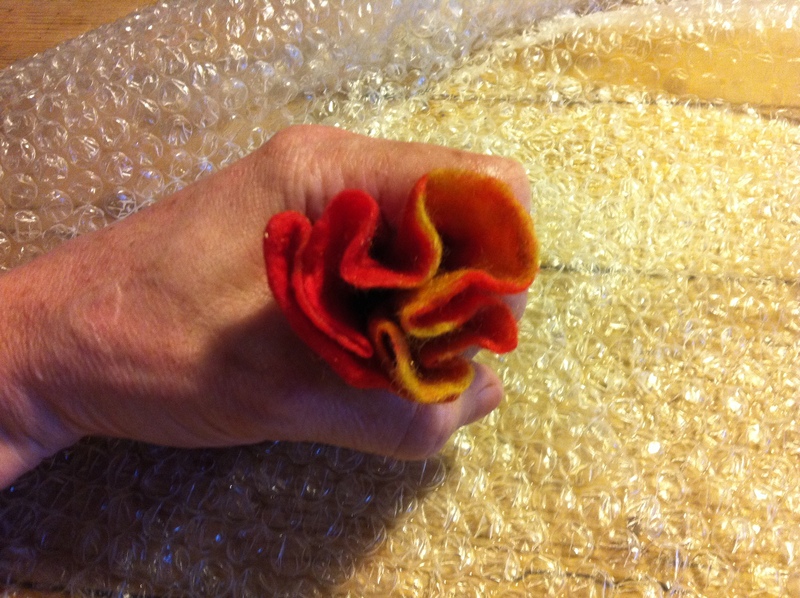 I like to place the tip of my index finger in the centre of the flower and work the felt around the outside of my finger. The flower will shrink by about one third to one half the original layout size, when you are happy with the result rinse in warm water, reshape and dry. Enjoy! Now for two thumbnails, WordPress is playing silly games today so apologies I can’t seem to upload any more! Lovely day yesterday, Borris Market and felt flower tutorial is on the way …..
Alan and I had a lovely day yesterday, thanks for all the best wishes for his birthday! This morning has been spent making all the last purchases for Christmas (as opposed to last minute purchases!) and driving into Bagenalstown to hand deliver a present. Now I have the stove lit, a chicken to go in the oven and some flowers to felt for my mother. I also need to make a nice piece of flat felt which will then be cut and stitched into a ‘smart phone’ cover as requested by my sister Lizzie. I am planning to take some pictures of the flowers in progress and then I’ll post my felt flower tutorial as promised, that’s the plan anyway! As things stand I doubt that I’ll get to any emails or similar today but once tomorrow and the final selling opportunity for my felt is over Saturday is a new day. Tomorrow morning I will be back in Borris Farmer’s Market with more 3 for E30 specials, please call in and say hi if you are in the area! It’s Alan’s birthday today so I won’t get to blog, reply to comments, check email or update FB properly until tomorrow at the earliest. We’re meeting friends for lunch, celebrating the Winter Solstice with more friends in the afternoon and then walking through the fields to Ballymurphy the our local pub in the evening with yet more friends, fun! This is in addition to delivering some felt and showing another friend my stock, so until tomorrow then, adieu!!! I’m not quite ready yet but I’ve been writing a simple felt flower tutorial for the 15 minute lesson I have to give as part of the Train the Trainer workshop I’m participating in. I’m not going to have a lot of time to blog over the next couple of days but I will post the tutorial when it’s finished! Well I’m home, fed and watered now, so is Rex! It was a beautiful but icy day when I headed in to Borris this morning to set up my stand, luckily the heaters were working overtime in the hall so it was nice and warm inside even if the fish man was freezing outside. The dynamics of our potential customers appeared slightly different today, almost without exception everyone who came to the market was primarily interested in stocking up on seasonal food, the people who also had a look at the various art and craft stands only purchased if they were totally sure that they needed the items. It’s very obvious that there are no snap descisions being made or impulse buys as would have been commonplace a few years ago. For this reason I’m happy with the descision I took a couple of weeks ago to offer good value on felt flowers, rings and brooches, today I extended the offer to include my latest phone/camera covers and needle filled cases too. I did sell a handfull of these during the course of the morning but no sales totalling more than a collective E30 for 3 items, I don’t think this way of selling product can be classified as a get rich quick scheme, do you? 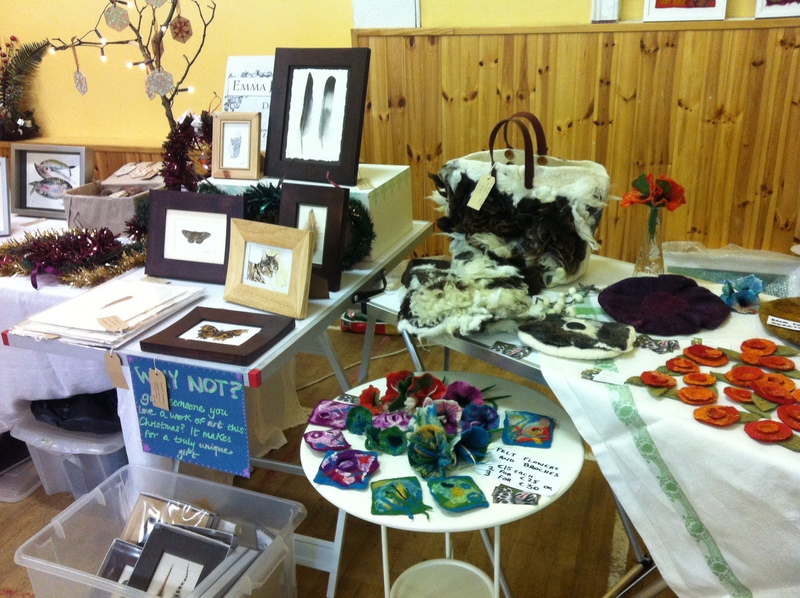 Overall however, I still feel it is a good local venue to promote my workshops, sell some stock, meet friends and enjoy a warm drink while munching delicious home made cookies. Next week is the last Friday before the big day itself, will we have a big rush of last minute buyers looking for some artisan stocking fillers? I for one, certainly hope so!! !